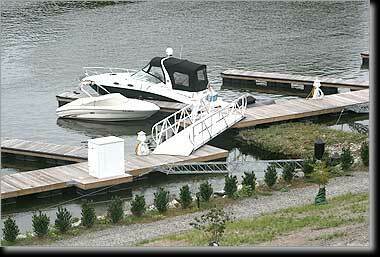 Planning for the new marina began in 2004 and the regulatory permit process was initiated in 2005. Through several meetings with regulatory staff from VMRC and the Corps of Engineers, the marina layout was adjusted and permits were approved. With a federally maintained channel in the James River, Rocketts Landing Marina is a linear marina stretching along 1,900' of the river. A total of 89 floating boat slips will eventually be installed in a 60° alignment downriver with floating docks. In addition to the floating and fixed boat slips, a Harbor Master's office will contain restroom and shower facilities, and two additional buildings along the riverfront are proposed for additional restrooms and showers. Complementing the boat slips will be restaurants, picnic pavilions, a swimming pool, and riverfront promenade providing access to downtown Richmond within just a 15-minute stroll.